I can't believe it has been 6 months since my blog was born! I feel so proud of what I've done with it already. The support from the blogging community has exceeded my expectations. It's wonderful how friendly and helpful everyone is! 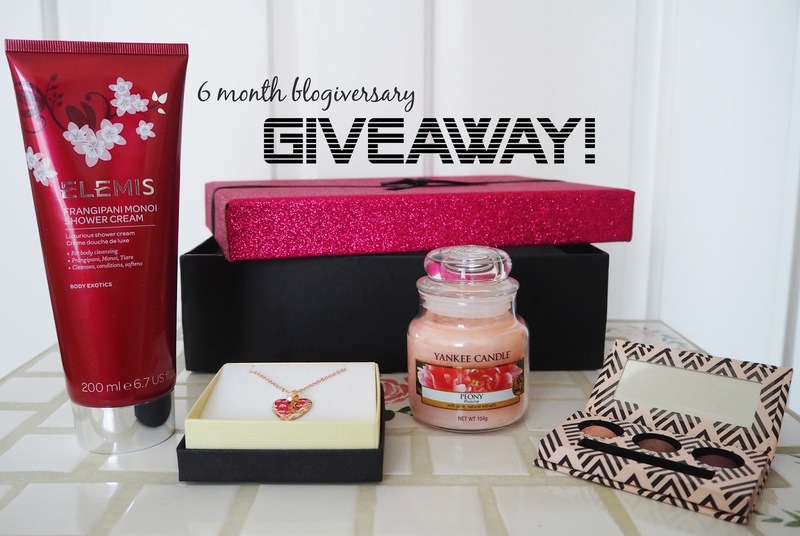 In honour of my 6 Month Blogiversary and as a thank you to all of my lovely loyal readers I am giving away this selection goodies from brands that I really love and am confident you will too! Elemis Frangipani Monoi Shower Cream: Enjoy a full size (200ml) of this exotic Elemis favourite. "This Tahitian monoi and frangipani flower infused shower cream leaves skin beautifully scented, soft and supple." Small jar of Yankee Candle Peony: This fragrance is a brand new release to the UK for spring! Described as "The rich scent of Spring's most coveted bloom - the peony - entices with notes of bright sweetness." Laura Geller Eye Shadow Trio: A beautful Baked 'Romanesque' Eyeshadow Palette: in shimmering champagne (baroque), mocha (café) & plum (roma) with small brush. Rose Gold Heart Necklace: As some of you will know I make jewellery which I sell in my etsy shop so I am including in this prize one of my favourite necklaces (complete wth swarovski crystal) from my brand new Rose Gold Collection! It comes in t's own gift box and is of coure handmade by me. All you have to do to enter is to scroll down to the bottom of the post to find the entry form. There you will gain entries for following, liking and subscribing to my various social media channels. However what I would like most if all is for you to leave a comment telling what your favourite blog post(s) of mine is from the last 6 months. You can go back through my archive, located in the sidebar to your right - there are 45 posts to choose from! For this you will gain 3 bonus competition entries. My giveaway is open from 1st of February - 1st of March 2016. Entries will be verified and then the winner will be selected on the 1st of March and contacted via email. If however the winner does not reply within 3 days it will be considered unclaimed and a new winner will be selected. Anyone is eligible to enter this is a worldwide giveaway. amazing! Prints in the Park | Outfit was so great!! MY JEWELLERY PARTIES is my favorite. Nice Giveaway. Its always great when you reach a blog milestone. I loved reading your new year resolutions post, I find you can gain inspiration and motivation from posts like this from other bloggers. I also like a good recipe post/idea so the soda bread and Christmas bark were also favs. Hello. I'm a new follower to your blog but glad I've found it. Congratulations! Being as obsessed with baths as I am, I liked your Lush valentines day haul. I'm hoping the Vday things will still be in the shops on Saturday. Fingers crossed. Congratulations on your six months :) You have an amazing blog and work very hard on it weldone! I really enjoyed reading your New York Haul blog post all the products look amazing! The huge candles are fantastic I can't wait to try them, I am loving the sound of the Champagne toast candle oh yummy! Congratulations on reaching your 6 month blog milestone. I loved reading your new year resolutions post, I also love recipes and foodie ideas and especially the Christmas bark post. Keep up the great work, love reading and your photos are fab. The New York posts as its a place I dream of. Love the Lush Valentine's one. The tarte cosmetics one was my fav! Fab blog! I loved your lush post, I'm a huge fan of lush! I loved your Christmas candle blog post. Helped me buy the perfect Yankee candles for Christmas for my mother! Also so jealous of your gingerbread candle holder!! I love your Tarte Cosmetics Makeup Set review and desperately want one now!